Seabed survey work for the Hibernian Express, as the 6,021km (3,741 mile) fibre-optic link will be known, is already under way off the east coast of America. The last cables laid under the Atlantic were funded by the dotcom boom in the 1990s when telecoms infrastructure firms rushed to criss-cross the ocean. The laying of the new transatlantic communications cable is a viable proposition because Hibernia Atlantic, the company behind it, is planning to sell a special superfast bandwidth that will have hyper-competitive trading firms and banks in the City of London and New York queuing to use it. In fact it is predicted they will pay about 50 times as much to link up via the Hibernian Express than they do via existing transatlantic cables. 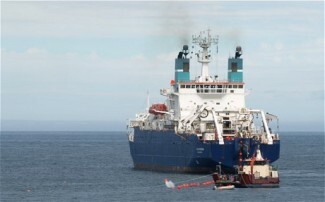 The current leader, Global Crossing’s AC-1 cable, offers transatlantic connection in 65 milliseconds. The Hibernian Express will shave six milliseconds off that time. Of course, verifiable figures are elusive and estimates vary wildly, but it is claimed that a one millisecond advantage could be worth up to $100m (£63m) a year to the bottom line of a large hedge fund.